Is your home ready to take on heavy rain? Avoid flooding in your basement with a professionally installed sump pump. 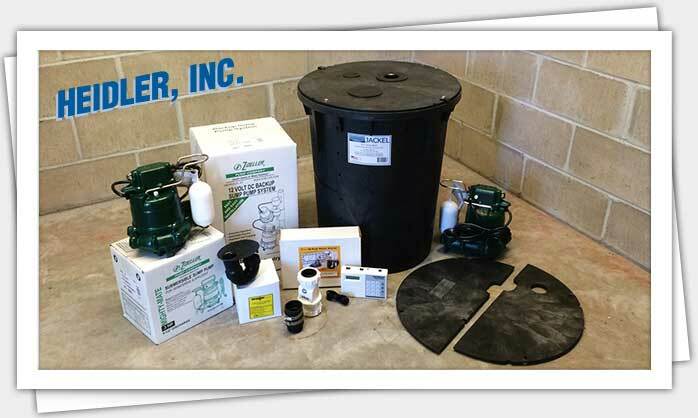 Call Heidler, Inc. at (410) 268-7191 to work with the top Annapolis sump pump technicians. Click here to view our current specials and discounts. We often receive calls from customers asking to have their sump pump repaired or replaced. Keep your home safe from excess rain and snow with your local Annapolis sump pump service technicians at Heidler, Inc.
Do you live on a floodplain but don’t have a sump pump? Is your current unit malfunctioning? Avoid flooding in low lying areas of your home (such as basements and crawlspaces) by installing the right sump pump for your needs. Sump pumps keep your home from retaining flood water and help keep your property safe from water damage. During an initial home visit, we will determine the ideal sump pump for you based on your home’s needs and the surrounding area. Your sump pump is guided by a float switch. As the water level in your sump pit rises, the switch floats up; this powers the sump pump on when excess water starts to rise above your water table. If the switch is clogged or jammed, the float switch can become stuck and leave your pump running. The switch may also be accidentally disabled if the sump pump starts leaning along the edge of the pit; this can lead to difficulties flushing out excess water. A short cycle occurs when your sump pump continuously turns on and off, reducing your pump’s efficiency and lifespan. This problem is often the result of a sump pump liner that is too small for the actual pump; this leads to water being discharged much faster than the liner can fill, creating a short cycle. This prevents excess water from leaving your home. We recommend attaching a grated discharge line to your existing line. This grated line allows water to easily flow out if the main discharge pipe is frozen or blocked. As water is discharged out of your home, it passes through the sump pump check valve. This valve prevents discharged water from entering the sump pump again. If your check valve is missing, or if it is not working properly, we will install or repair it for you. If you notice these or other problems, contact us for immediate help. We will repair or replace your sump pump so you can avoid costly water damage. Think your sump pump is the wrong size? Is your unit not working as efficiently as it used to? Let us help you solve the problem. Call us today at (410) 268-7191 for guaranteed quality solutions at a flat rate.